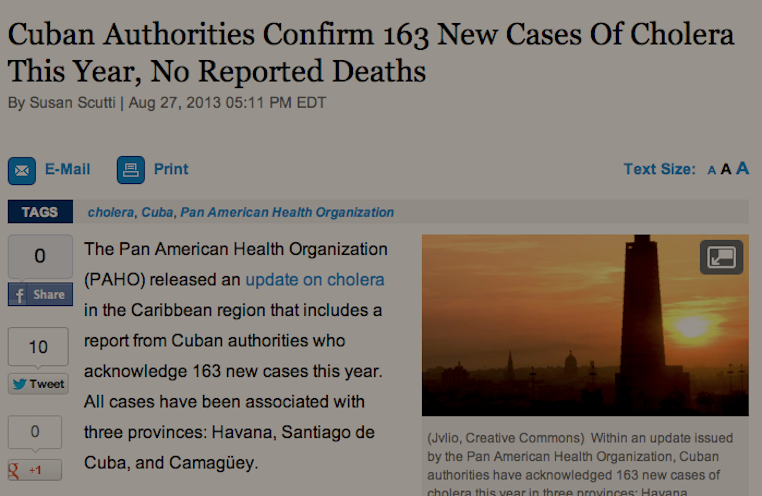 The Pan American Health Organization (PAHO) released an update on cholera in the Caribbean region that includes a report from Cuban authorities who acknowledge 163 new cases this year. All cases have been associated with three provinces: Havana, Santiago de Cuba, and Camagüey. In nearby Haiti, thousands have died of the infection since the beginning of an epidemic in October 2010, ten months after the devastating earthquake. Cholera remains a public health threat in the entire region, also affecting the Dominican Republic which has reported thousands of cases though only 454 fatalities since October 2010. In the past several weeks, five cases of cholera, all related to travel to Cuba, have been reported in Italy (1), Venezuela (2) and Chile (2). Over the past year, other confirmed cholera cases include travelers from Germany, the Netherlands, and Spain. The U.S. issued a travel alert for Cuba as of last week. According to the PAHO update, the cases recorded in Havana have been linked to two food service centers “where the presence of asymptomatic persons infected with cholera among food handlers was found.” Appropriate sanitary measures have been taken since this discovery, authorities note. Person-to-person transmission is not common, according to the Centers for Disease Control and Protection. Following a 2012 outbreak in Manzanillo, with 417 confirmed cholera cases, the official Cuban media, including the Communist Party newspaper Granma, has remained silent about the matter, reports NBC News. Now, the Cuban government has reported implementing an appropriate response to the current outbreaks while the Institute of Tropical Medicine has confirmed the detection of V. cholerae Ogawa serogroup O1 in all cases.